M.J. Cecava, Rumen Physiology and Energy Requirements. T.W. Perry, Vitamin Requirements of Beef Cattle. T.W. Perry, Mineral Requirements of Beef Cattle. M.J. Cecava, Protein Requirements of Beef Cattle. D.M. Forsyth, Computer Programming of Beef Cattle Diets. T.W. Perry, The Effect on Processing on the Nutritive Value of Feedstuffs for Beef Cattle. M.J. Cecava, Pasture andother Forages. M.J. Cecava, Hay and Haymaking. M.J. Cecava, Silage and Crops for Silage. M.J. Cecava, Concentrates for Beef Cattle. T.W. Perry, Breeding Herd Nutrition and Management. T.W. Perry, Forages and Environment Effect on Brood Cows. T.W. Perry, Milk Production and Calf Performance. T.W. Perry, Starting Cattle on Feed. T.W. Perry, Feeding Stocker Cattle. T.W. Perry, Cattle Finishing Systems. T.W. Perry, Economics of Cattle Feeding. T.W. Perry, Environmental and Housing Effect on Feedlot Cattle Performance. T.W. Perry, Implants and Nonnutritive Additives for Beef Cattle. D.C. Petritz and K.S. Hendrix, How Much Can I Afford to Pay for Feeder Cattle? T. Grandin, Some Current Specifications for Beef Cattle Equipment. T.W. Perry, Nutrient Requirements of Beef Cattle. T.W. Perry, Typical Compositions of Feedstuff for Cattle. Subject Index. This new edition of T.W. 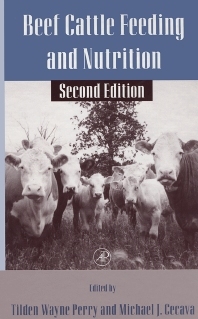 Perry's classic reference provides both updated, and new information on the feeding and nutritional requirements of beef cattle, from breeding [or growing] to finishing. All the critical components of diet are dealt with: vitamins, minerals, protein, silage, etc. The different nutritional needs of breeding cattle are also detailed. Thoroughly updated to help ranchers and feedlot managers maximize yield and efficiency, this Second Edition should be on the shelves of all those involved with beef cattle herd management and production. This book is intended as a reference book for animal scientists and veterinarians. A significant portion of the market is as a classroom text for courses devoted to bovine nutrition. Nutritionists for the beef cattle industry,county and state livestock agents, feed manufacturers, cattle ranchers, and managers.